While our bodies age, scientists believe that our DNA at least remains constant. New research, however, reveals that, even though its sequence remains constant, subtle chemical changes occur to our DNA as we age—and it could explain why the risk of developing disease increases as we get older. DNA is made up of four basic chemical building blocks, called adenine, thymine, guanine, and cytosine. It's the sequences of those chemicals in a strand of DNA that determines what function a gene has, and one of the ways the resulting genes are controlled is a process called methylation. That just means that a methyl group — one carbon atom and three hydrogen atom—bonds to part of the DNA and subtly change its function. New research, published in PNAS, however, shows that as we grow older our DNA's susceptibility to methylation changes. A team of researchers from the Bellvitge Biomedical Research Institute in Barcelona, Spain, extracted DNA from white blood cells of twenty newborn babies and twenty people aged between 89 and 100 years old, then compared their respective degrees of methylation. In a newborn baby 80.5 percent of cytosine nucleotides were methylated, while in centenarians that figure dropped to 73 percent. An intermediary example, taken from a 26-year-old male subject, exhibited 78 percent methylation. 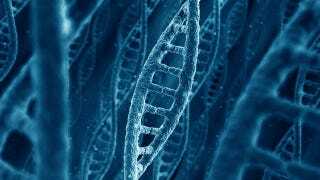 It's not clear why it happens, but the researchers speculate that it could be due to extremely subtle age-related changes to the DNA. But what the hell does it all mean? Well, taking a closer look at the samples, the researchers discovered that a third of the methylated groups which were in different positions in the elderly compared to the young are already known to be linked to cancer risk.